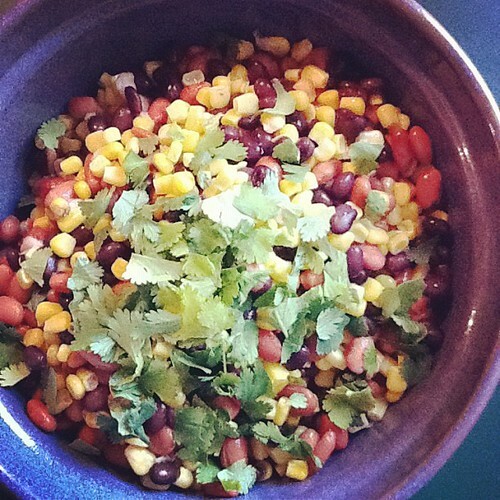 Canoe Ridge Creations: warmer weather + fresh bean salsa. warmer weather + fresh bean salsa. it seems as if warmer weather is here to stay in Iowa. we've had almost two straight weeks of record temperatures for this time of year -- yahoooo! the grass is green, flowers are blooming, birds are chirping, and it means one very important thing here at the CRC household....GRILLING SEASON! and our favorite thing to pair with a little summer BBQ is this fresh bean salsa! let me warn you -- this stuff is addicting! it's so, SO good -- you just can't stop. mmmmm! in a large bowl, combine black beans, whole corn, and pinto beans. finely chop the peppers & red onion and add to the bowl. next, add some fresh cilantro leaves (we like lots in ours!). in a medium sauce pan, combine the olive oil, vinegar, and sugar -- if you want, you can and a bit of minced garlic as well. over medium heat, bring to a boil. simmer for 1 minute then let it cool. once it's cool, pour it over your bean+ vegetable mixture and stir. refrigerate. do you love to cook out+grill? 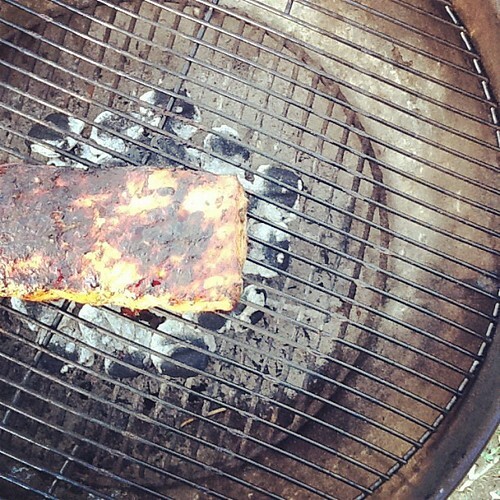 what are some of your favorite summertime recipes? I understand the warm weather. I was in the store the other day looking for peaches and realized, it's March. Not really peach season, but the warm weather is confusing me! Yum! I'll be making this soon. It has been HOT at our house. Almost 90 yesterday. Huh, we got 2 record breaking weeks, and then it SNOWED today!!! Hope you don't regress too! It's cold as ever here (Portland, OR) and rainy ~ last month we had record breaking rain. Really looking forward to some warmer days and SUN! Thanks for the recipe ~ sounds yummy! Nice! This looks incredible, and right up my alley. I'm heading to Iowa in an hour or so for Easter weekend, looking forward to the beautiful weather! !